Asher Angel and Jack Dylan Grazer are ready for a Justice League vs. Avengers movie. The young Shazam! stars have even decided who would win that crossover battle. The DC and Marvel rivalry has gone on for decades and it shows no sign of stopping any time soon. 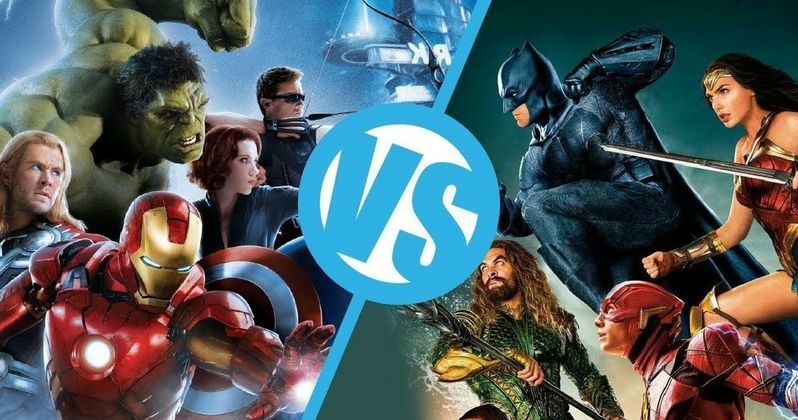 The emergence of their respective cinematic universes has only amplified that rival and while there are obviously fans of both, a lot of fans are waiting for the rival studio to fail at the box office. But, what would happen if the The Avengers went up against the Justice League? Shazam! star Jack Dylan Grazer believes that a crossover movie would be pretty great and there are likely more than a few other fans that share his enthusiasm. While the logistics of that are near impossible, Grazer still holds out hope. He had this to say about a potential Marvel vs. DC battle on the big screen. "People want that and I think that would be sick. I think that would be so sick. Justice League vs. the Avengers." Asher Angel noted that DC and Marvel are "two different universes," but Jack Dylan Grazer doesn't seem to care. He was quick to point out, "Justice League would win." Grazer almost has to say that answer, even if he believes it or not. But it does raise a good question of who would win if it came down to it. The original six Avengers consists of Captain America, Iron Man, Thor, Hawkeye, Black Widow, and the Hulk. Justice League has the Flash, Superman, Wonder Woman, Batman, Aquaman, and Cyborg. As for which DC heroes they'd like to team up with, Asher Angel says that Jason Momoa's Aquaman would be his pick. Angel plays the young Billy Batson in Shazam! and Jack Dylan Grazer's Freddy Freeman wears an Arthur Curry shirt through most of the movie since he's a big fan of superheroes. Aquaman and Shazam! would be a pretty good team, which would probably go over pretty well on the big screen, but Warner Bros. is currently shying away from the interconnectedness of the DCEU. Both Asher Angel and Jack Dylan Grazer love Batman. Grazer declares, "Batman is my favorite person on the planet," before joking that Val Kilmer and George Clooney are his favorite actors to portray the Dark Knight. When it comes down to it, he's more of a purest and likes Michael Keaton, Adam West, and Christian Bale, which may start some arguments. Angel and Grazer are hyped to be in Shazam! which is preparing to hit theaters in just a few short weeks. Hopefully it will be another homerun for Warner Bros., along with Grazer and Asher. You can head over to Comic Book to read the rest of the interview with Asher Angel and Jack Dylan Grazer.